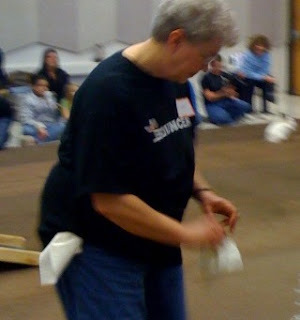 But this Sunday, it was the Humane Society! We arrived in the parking lot to find masses of cars. We were shocked to see mini vans double parked and station wagons packed in. We were forced to park in a neighboring parking lot, and were thrilled at the thought that so many people had come to adopt pets. We walk in and hear squeals and shrieks. 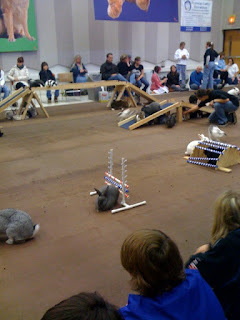 We look to our right and see the world's supply of rabbits in a ring. 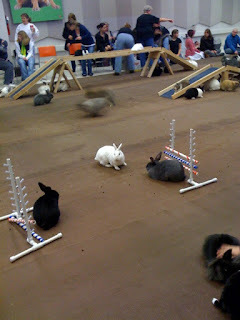 We investigate and find that it is, "Hoppy Hour" at the Humane Society. Oh yes, "Hoppy Hour!" Apparently, it is like doggy day care, but for rabbits. 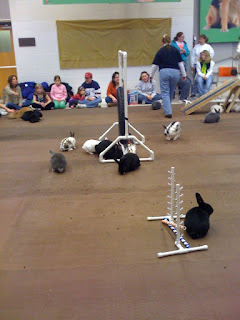 Bring your rabbit, sit in a ring, and watch them perform agility activities with...get this..."Bouncers" to supervise! Jeremy thought that several of them were not house pets, but rather plucked from their back yards as they looked quite wild. So if you're looking for some fun - I recommend a trip to Hoppy Hour. It is sure to be a hopin' good time. It Certainly won't be a flop. It may be a bit Hare-ey to park. Wow! Who knew?!?! You should've brought Punky - she would've made some friends her own size!